ESPN has taken another solid step in its effort to provide full soccer coverage to fans worldwide with the introduction of ESPN FC, an effort that will provide umbrella branding for all of its diverse soccer media coverage. This appears to be the network’s biggest step yet and will include a multilingual, multi-nation push to expand and brand its coverage and will include television, print, Internet, radio and online aspects to the branding effort. ESPN’s soccer coverage has been a work in progress, and we mean that in a positive way. In the last few months it has been taking incremental steps to improve its coverage even after it lost broadcasting rights to future World Cup tournaments. There are a number of ingredients to the ESPN FC effort, and not all of them are in place yet. Looking forward it plans to add local and regional contributors so that it has full 24/7 global news coverage of the sport. Hand in hand with that will be the ability to deliver content based on where a fan is accessing the network weather from a mobile device, the Internet or television. The channel kicks off the new branding effort with its coverage of the Euro 2012 tournament in the Ukraine and Poland. It already had plans to broadcast the matches; they will now be the first to have the new branding as well. For the upcoming tournament ESPN FC will also have a feature called Euro 2012 Top 40 Player Rankings which will include contributions from the network’s soccer experts. With the European season winding down the new brand will really see an uptick later this year with the start of the new seasons for leagues worldwide will see coverage of more than just the European leagues. As part of this effort ESPN will bring increased soccer coverage to its Spanish language channel into ESPNdeportes.com as well as produce Spanish-language online, mobile and print content for fans. Other features will include a new version of GameCast called Live MatchHQ that will provide game data and imagery while also providing news and score3s from elsewhere around the league. The May 18th issue of ESPN: The Magazine will include a Euro 2012 preview section with a feature on Wayne Rooney as the cover story. 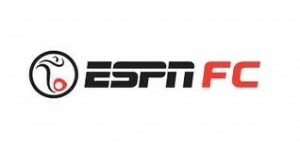 Last but not least ESPN FC will launch a pair of fantasy games for the Euro 2012 tournament. One is called Euro 2012 Bracket Predictor and the other is Euro 2012 Manager where fans can select fantasy rosters and win points. ESPN FC appears to be a great idea from ESPN, unifying coverage that at one time was in multiple places and enabling fans to go to a single source for all of their soccer information. While Fox Sports also increasing its coverage especially Premier League coverage, hopefully the competition will make both provide more that fans want, rather than air time fillers that it occasionally seems.